1928 SK Wheat Pool Jrs. 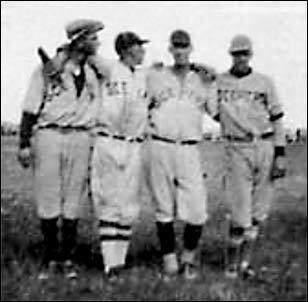 The ALBERTA SOUTHERN LEAGUE began with six teams, but the Calgary Hustlers and Calgary Athletics and later High River dropped out, leaving just Claresholm, Blackie and Stavely. The summer of 1928 seemed to be the low point of the decade with respect to the prominence of baseball within some areas of the urban heartland of southern and north-central Saskatchewan although this phenomenon didn't seem to exist to the same extent in the rural communities. Box scores were glaringly absent from the sports pages of the Moose Jaw Evening Times and, to a lesser extent, the Saskatoon Phoenix as intra-city baseball leagues of previous seasons had vanished in both of these centres although a resurrection would ultimately occur in 1929. Also gone in the south country were the semi-pro squads which had graced the dusty diamonds of the wheat province just one summer previous. Even the frequency of small-town tournament play and exhibition games with travelling teams appeared to have diminished and many of the exhibition games involving touring clubs found the barnstormers facing one another rather than playing against local opposition. The elite baseball players in Moose Jaw did form a leagueless team and participated in a handful of these exhibition matches and tournaments but the number of games that they actually played in was but a fraction of that which they were normally accustomed to. In the Queen City, the four team Northside League did get off the ground and, after a first-half winner was declared, just fizzled to a quiet halt in late August without any second-half winner or any attempt at a playoff. The moguls in Saskatoon began the season with lofty expectations, forming a club of select players from the area and joining a three-team circuit known as the Independent Baseball League. With semi-pro overtones, the local players were supplemented with a few recruits from other parts of Canada and the United States. Facing adverse weather conditions amongst other things, the fan turnout for games, especially in Rosetown and Biggar, was disappointing and the last known game played under the league banner appears to have been on July 14. A week later, the prestigious Saskatoon exhibition tournament took place and nothing was ever mentioned in the local print media again with respect to the defunct Independent League. No evidence was found in any of the leading newspapers that any attempt had been made to stage the usual provincial senior amateur playoffs in Saskatchewan. While Saskatchewan senior level baseball had its struggles in 1928, the same did not hold true for southern Alberta where amateur baseball seemed to be thriving. Other than some early season difficulties within the senior amateur Southern Alberta League from which three teams (Lethbridge Miners, Macleod and Spring Coulee) dropped out, small regional leagues abounded and tournament play continued to be a regular occurrence. The semi-pro Alberta Southern League of 1928, however, became a financial failure. The Saskatoon Star-Phoenix reported that the Claresholm club, with Dodger Lewis (right) on its roster, had a monthly payroll of $1,500, a huge sum in that era. In spite of a high calibre of play on the diamond, the loop was cursed with unfavorable weather conditions, small gate receipts and heavy expenses which combined to seriously weaken the circuit. The two Calgary teams were the first to wave the white flag and throw in the towel at the end of June. The four rural representatives decided that the games played to that point would be considered the first half of the schedule and that any matches beyond that point would be second half games. Blackie, with a 5 – 1 record, was declared first-half champion. High River soon buckled under the red ink and called it a day, leaving just three teams. Players were being released to trim payrolls and rosters were being augmented on almost a pick-up basis. Claresholm and Stavely played the league’s final game on August 9. Numerous teams registered with the AABA for participation in the 1928 provincial playdowns. The hodgepodge of clubs, however, completely ignored the Alberta senior amateur division and opted, instead, for competition within the intermediate section. A small town team, the Cardston Maple Leafs, won five separate best-of-three series to capture the 1928 crown. Sceptre, Saskatchewan, was a baseball powerhouse on the prairies into the late 1950s. Their 1928 roster included (from left to right) - Nick Berger, Harold Horeak, Ronald Beele, and Lefty Cleaver. Ray Flaherty, shortstop for Stavely in 1928 (and Blackie in 1927) went on to a Hall of Fame career in football. The Gonzaga University product played pro ball with the Los Angeles Wildcats, New York Yankees and New York Giants. After one season as head coach at Gonzaga (1930), Flaherty took over the reins of the Boston/Washington Redskins where his successes included two league titles and four division pennants. After military service in the Second World War, he took over as head coach of the New York Yankees where he captured two division championships. Flaherty is credited with inventing the screen pass (1937). In 1976, he was inducted into the Pro Football Hall of Fame.